Baby Phat is a clothing line founded in 1991 that was intended to be an iconic brand for stylish, metropolitan women and young girls. The Phat part of the Baby Phat name is actually an acronym for pretty, hot, and tempting. Everyone from fashion models, actresses, and other fashionistas soon sported tiny baby tees, propelling the line into the limelight. Pastry is also a clothing line, established in 2007 as a brand of clothing for young girls. Unique and bold, Pastry is all about allowing juniors to express themselves freely when it comes to what they wear. Established by Kimora Lee Simmons in 1998, and created to enhance a full figured woman's curves, Baby Phat filled a fashion void. The former wife of Russell Simmons as well as being a former fashion model, Kimora combined her sense of style with a unique, elite flair for design. Sold in 2004 to Kellwood, Baby Phat continues to provide top quality designs in clothing and more. Vanessa and Angela Simmons of MTV's Run's House fame created the new generation of women's clothing with Pastry. The look of the Pastry brand is bold and sophisticated, but youthful and eye catching. As the daughters of Reverend Run, it comes as no surprise that the girls would turn heads with bold color twists and materials. Baby Phat has an entire line of women's fashion of course, but also paved the way in urban outfitting of men with the Phat Farm line of clothing created by Russell Simmons, brother of Reverend Run and ex-husband of Kimora Lee. It is hard to imagine a product not made by Baby Phat since everything from beanies to diaper bags and belts to sunglasses are available. Pastry's trendy brand of shoes, embroidered and glittered clothes, handbags, and sunglasses are upbeat, artistic, and sometimes shiny and always fresh. Baby Phat is a style of premiere urban influence and style. From lingerie to outerwear and accessories, Baby Phat is exceptionally well crafted and priced within normal ranges. 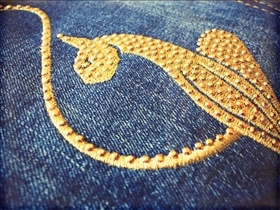 The signature jeans of Baby Phat are hip hugging and sensational, an embodiment of the brand itself. Described as both urban and luscious, Pastry clothes, shoes, and handbags are stretchy, metallic, colorful, and fashion-forward. The girls are both college educated and have aspirations of acting and singing. Angela is even the editor of an entertainment magazine. They are both trendy followers of iconic designers such as Chanel and Louis Vuitton, but love the comfort of tracksuits. Baby Phat and Pastry are both American clothing, shoe, and accessory companies created by members of the Simmons' family. The daughters of Reverend Run and his brother Russell Simmons, along with Russell's first wife Kimora have created two globally popular lines of urban apparel that represents a lifestyle of both glamour and trendsetting. Kellwood now owns Baby Phat, but Pastry is still under the leadership of Vanessa and Angela Simmons. Pastry is an easy way for young girls to express themselves with fashion that is well crafted and affordable.